Scores are presented as total raw scores as well and two percentiles, one based on a community sample of adults and the other based on a student sample (mean age = 19.5). High scores indicate more symptoms of depression. Further interpretation of individual responses can be done in light of the symptoms clusters of Major Depressive Disorder. 1 - Sadness (Dysphoria): Questions 2, 4, 6 2 - Loss of Interest (Anhedonia): Questions 8, 10 3 - Appetite: Questions 1, 18 4 - Sleep: Questions 5, 11, 19 5 - Thinking / concentration: Questions 3, 20 6 - Guilt (Worthlessness): Questions 9, 17 7 - Tired (fatigue): Questions 7, 16 8 - Movement (Agitation): Questions 12, 13 9 - Suicidal ideation: Questions 14, 15 According to the DSM-5 criteria, diagnosis of Major Depressive disorder can be made if five (or more) of the above symptoms clusters are endorsed and at least one of the symptom is either (1) depressed mood or (2) loss of interest in pleasure. Radloff LS. 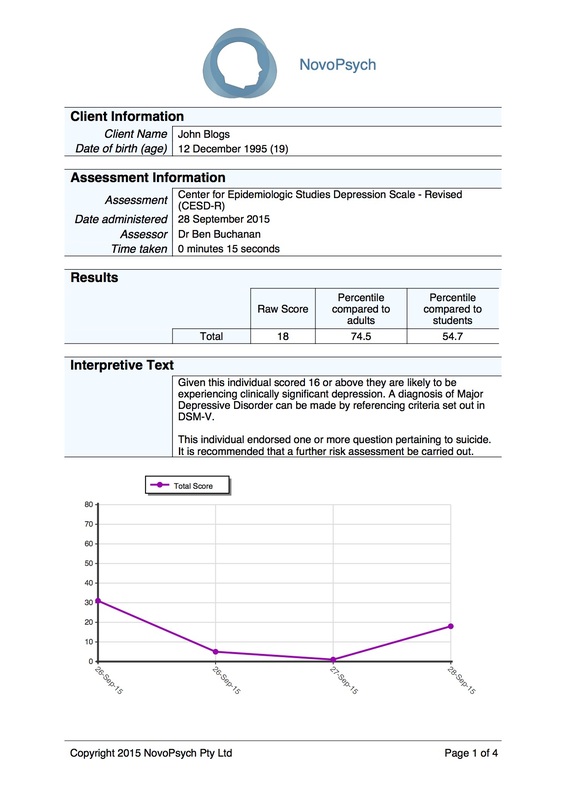 The CES-D scale: a self-report depression scale for research in the general population. Applied Psychological Measurement. 1977;1:385-401. 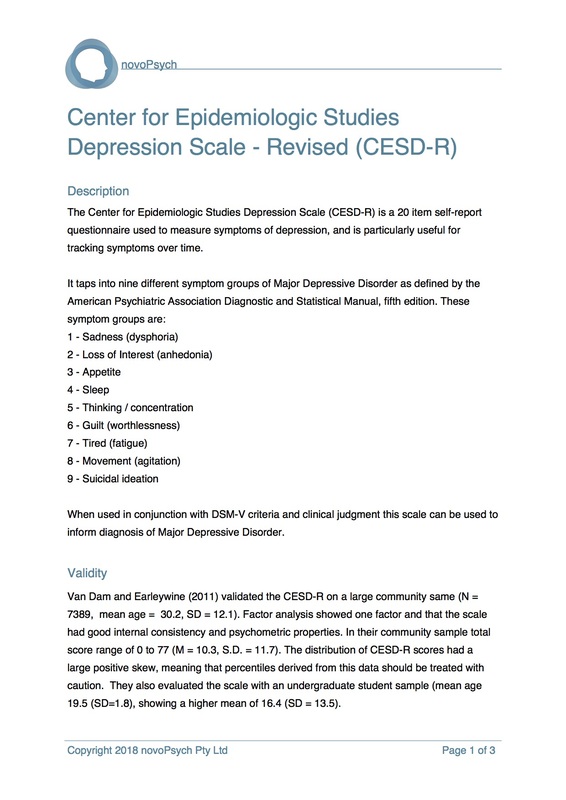 Eaton WW, Muntaner C, Smith C, Tien A, Ybarra M. Center for Epidemiologic Studies Depression Scale: Review and revision (CESD and CESD-R). In: Maruish ME, ed. The Use of Psychological Testing for Treatment Planning and Outcomes Assessment. 3rd ed. Mahwah, NJ: Lawrence Erlbaum; 2004:363-377.